Bloggers and marketers, don’t you just wish you could come up with headline titles that instantly hooked readers to your blog posts every single time? Well, now you can with Thrive Headline Optimizer. You spend countless hours, heck, even days or weeks, crafting the best piece of content for your blog. You make sure you’ve added everything you can possibly add to make your post awesome: Images, stats, and data, videos, quotes, infographics, slide presentations, screen captures, the whole shebang. You optimize your post for maximum search engine visibility. Yep, you really feel as if your post is going to be a huge traffic puller in time. Your post hardly gets any views, social shares, or even comments. Hello, is anyone taking notice of your post out there? I know the feeling trust me, it’s gut wrenching, especially when you’ve spent so much time crafting what you believe to be the perfect blog post. So, what could have possibly gone wrong? You went and gave it the most boring, the most uninspiring, the most unimaginative, ‘un-click-worthy’ headline title ever! The worst thing is, you probably don’t even realize just how much of an impact this is having on your readers. People simply avoiding clicking on that all-important headline title link to read your post, all because the title itself is simply NOT compelling enough for them. Did you know that 80% of readers never make it past the headline title? It’s pretty ‘freaking important’ that you get your blog post headline title right to start with from the word go, OK? Let me ask you a few additional questions. Wouldn’t it be wonderful if you could create headlines for your blog posts that would get you the most attention? Wouldn’t it be awesome if you could create super catchy headline titles that demanded to be clicked on, every single time? Wouldn’t it be great if you could use more than one, or even two, or three headline title ideas and test them against each other to see which one would get the most attention and clicks? Well, now you can, using a powerful headline conversion optimization tool called Thrive Headline Optimizer. Now I know what you’re thinking – There’s already a bunch of tools out there you can use to help you craft great headline titles, in fact, we covered some of those tools in this post. But there’s now an even better and REAL solution to creating killer magnetic headline titles for your blog posts or website content. Thrive Headline Optimizer (THO) is a plugin designed to help you create more compelling, attention grabbing, click-worthy headline titles for your content. With better headline titles you can even create more engagement on your blog, convert more visitors into subscribers or even leads into sales. Check out my video spotlight and tutorial below. How does Thrive Headline Optimizer work? This plugin works by analyzing three very critical engagement factors on your blog or website: Click through rate, how long someone spends reading your content, and how far down the page they are scrolling. It combines all the data collected from your blog posts, for each headline you test, then provides you with the best headline to use. Thrive Headline Optimizer Plugin comes crammed with some powerful and useful conversion options. Simple A/B testing of headline titles – Quickly test multiple headline titles to see which one will create the most impact for your blog post or content. Bulk test headline titles – For your existing content headline titles, you can use bulk-test to quickly give you the best results for multiple headlines. Detailed Metrics – For your A/B split testing, you can analyze vital data and metrics to see which headline title, is the winning formula for your content. Engagement Reports – With quick reports you can get a good idea of how much your readers are enjoying your content. Configure Settings – You can create the desired settings for selecting the automatic winning headline, and let Thrive Headline Optimiser work for you on auto-pilot. 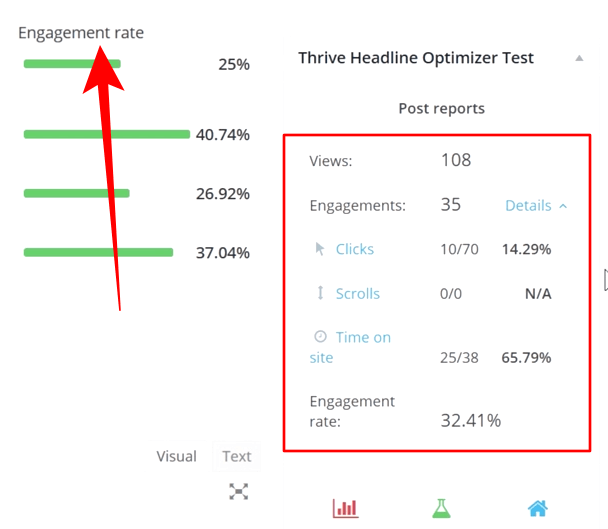 None-Techy Friendly – You don’t need to be a CRO expert to use the metric tools and A/B testing features inside the Thrive Headline Optimizer plugin, it’s powerful but also user-friendly for everyone. Detailed Reports – With detailed reports you can dive deeper into CTR’s, scroll through rate’s and see how much time is being spent on your content by your visitors. Woo-Commerce Compatible – How about maximizing your sales revenue by testing your WooCommerce product headline titles as well? Well, you can do this with Thrive Headline Optimizer. Advanced training with useful tips and tricks. Free updates on newly-added features, plus tutorial guides. Support from the Thrive team and over 19,000 Thrive members. 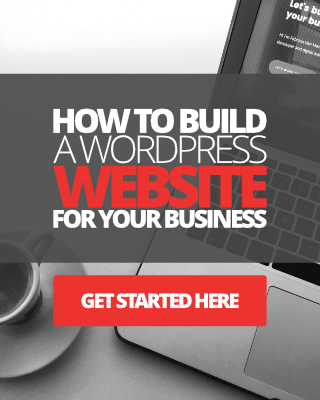 Once you have the plugin installed and activated on your WordPress site, you simply follow two additional steps. Step One: When you begin writing your post in the editor, you simply write as many headline titles as you can think of for the topic of the post you want to write about. There is a template provided for you to write your post title ideas (see image below). Step Two: This is the fun bit. Once you’ve published your post, the plugin will go to work automatically and begin doing A/B testing the headlines you created for the post. Time on content and more. It will then gather data on which headline title is working best for your content. It will then automatically select the winning headline title and you’re pretty much done. See image below. As for your other existing content post titles, you can also set the plugin to automatically go to work on testing different types of titles you put in. Perhaps you have a bunch of posts you want to improve engagement on, you can use the bulk test headline feature to do this for you. See image below. OK, like all good things in life, there’s always good and bad things… Let’s take a quick look at the pros and cons of using Thrive Headline Optimizer. Quick and easy to inastall. 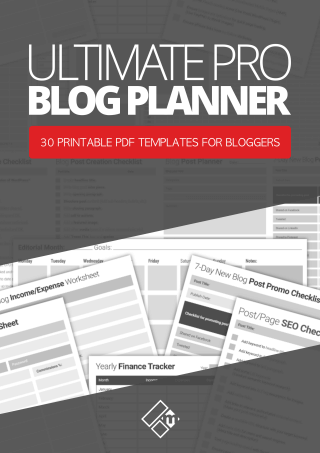 Can be used to test and optimize titles for most types of content headlines. 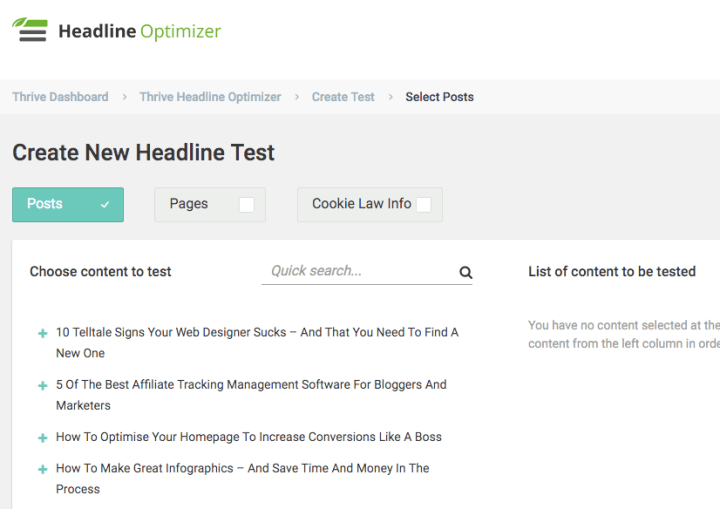 Can be used to test and optimize headline titles on your landing pages. Useful A/B testing feature with metrics and detailed reports. Sometimes, just sometimes, it slows down the editor. 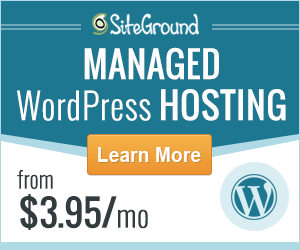 Only available for hosted WordPress sites. All in all, not a bad plugin. It will certainly have it’s uses for those bloggers and marketers obsessed with conversion rate optimization. Thrive Headline Optimizer is a fantastic addition to the Thrive tools family, it really is. 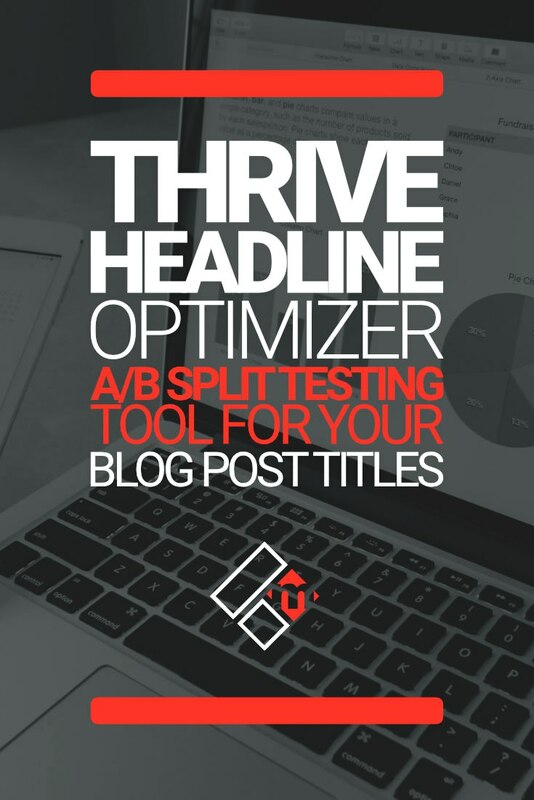 If you’re using other tools like Crazy Egg or HotJar to do A-B split testing for your content, I definitely recommend you check out Thrive Headline Optimizer. You’ll get far better and accurate data and results to work with, and you’ll save yourself a lot of time, money, and resources. OK, so you’ve seen what you can do with this plugin, so how much does it cost? Each plan comes with unlimited updates and 1 full year of support. You also get a 30-day money back guarantee if you’re not completely happy with the software. 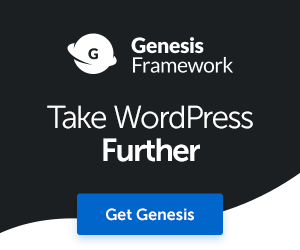 Once again, this is a plugin for WordPress hosted websites, so if you have a WordPress.com website this plugin will not work for it.